Author: Jae Young Lee, Lead Economist; Xianguo Huang, Economist. Another version of this article was published on the Myanmar Times on October 5, 2018. Myanmar has been transitioning to a more open and market-oriented economy over the past years. While progress has been made in all sectors of the economy, the manufacturing sector has witnessed rapid expansion. In 2007, it accounted for just 15 percent of GDP, but by 2017, its share of GDP had grown to 24 percent. The garment sector, in particular, has been growing rapidly with exports expected to surpass USD3 billion by end-2018, from less than USD1 billion in 2015. This remarkable expansion in manufacturing can be attributed to Myanmar’s comparative advantage in terms of low labor costs and the favorable external trade environment. While there are opportunities for Myanmar to expand this sector further, there are several challenges that need to be overcome. With a young and large population, Myanmar will enjoy a demographic dividend for the next few decades. While wages in Myanmar have increased with the minimum wage hike earlier this year, they are still among the lowest in the region. Preferential trade treatment is another key factor that contributes to the growth in export-oriented manufacturing. Myanmar enjoys preferential trade treatments in the US and the EU. Under the agreement with the EU, for example, the “Everything but Arms” initiative allows Myanmar to have tariff- and quota-free market access. There have also been concerted efforts by the government in developing the private sector and promoting exports, as outlined in its national strategies. These efforts have helped boost manufacturing in the country. Separately, once the New Companies Law that became effective since August this year is fully implemented, the improved legal framework will likely incentivize more manufacturing investment going forward. According to this new law, the redefinition of “foreign company” creates flexibility for companies to optimize corporate ownership and allows for more foreign participation in local firms. This will enable more sectors to access foreign capital, which is otherwise subject to restrictions. Even before the New Companies Law, an increasing amount of investment has already been directed to manufacturing sub-sectors such as food, beverages and chemicals, with manufacturing-related FDI approvals growing from USD1.2 billion in the 2016/17 fiscal year to USD1.8 billion the following year. As a result of these advantages and regulatory changes, manufacturing activity in Myanmar—particularly in the labor-intensive and export-oriented sectors—has grown rapidly in recent years. These developments notwithstanding, Myanmar needs to address some critical issues if its manufacturing sector is to develop to its potential. The lack of stable electricity supply and skilled labor, for example, continues to hinder the expansion of the manufacturing sector. Compounding problems for small- and medium-sized enterprises include their lack of access to bank credit, which hampers their ability to expand and upgrade their business and meet the demands of the local markets, let alone foreign markets. All of these conditions can inhibit growth in manufacturing. Due to these difficulties, Myanmar still ranks very poorly in the region in terms of the ease of doing business and logistics, especially transport and customs. Most importantly, the ongoing ethnic tension in the Rakhine state remains a key challenge to boosting private investment and attracting foreign investment from the western countries, amidst rising attention from the international community. 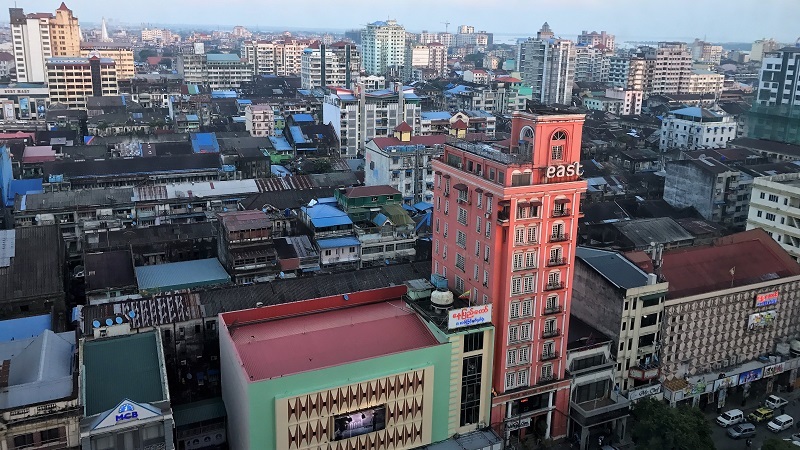 Utilizing the economy’s comparative advantages and addressing the aforementioned key challenges, the authorities in Myanmar have made efforts to catch up with its regional peers. For instance, to reduce bottlenecks such as high logistics and electricity costs in the face of limited financial resources, Myanmar is increasingly engaging with multiple stakeholders, including development partners and the private sector. Broader policy measures have also been taken to develop the market-based economy and ensure macroeconomic and financial stability, which directly or indirectly helped develop the manufacturing sector. A market economy can only function well under a stable macroeconomic environment, which will enable the manufacturing companies to make investment and production decisions in the medium- to long-term. In this sense, the importance of macroeconomic stability cannot be overemphasized. Sustained price stability and exchange rate flexibility will also contribute to maintaining price competitiveness of the overall manufacturing sector. Going forward, Myanmar needs to continue to push forward structural reforms, in particular, in the banking and financial sector, including things like developing the bond market, allowing for more flexibility in interest rate setting and allowing foreign banks to play a bigger role in the economy – these can improve access to credit and invigorate the private sector activities including manufacturing. What is perhaps even more important in boosting private investor confidence in the economy is the timely implementation of new laws and strengthening the rule of law, as pointed out in AMRO’s Annual Consultation Report on Myanmar 2018. While the challenges can seem overwhelming, they should not be insurmountable; and how well these challenges are tackled will shape the future of Myanmar’s economy, and its people.